I no longer live at the corner of 1912 and 1925. I recently moved into a 103 year old brick apartment building. This was a big change coming from the mid-century (ca. 1960) time-warp apartment I left – wood paneling, pink bathroom suite, Formica countertops – all very Mad Men-esque. I love old buildings; they often have special architectural details that you just don’t find in newer construction – high ceilings, claw footed tubs, odd little closets, built in furniture etc. This is the third time in my life that I have been fortunate to reside in a heritage building. The first was an apartment building at 15th and Granville. Originally built in 1912, Shaughnessy Mansions (as it was then known) was designed by the architectural firm of Townsend & Townsend. They were known (infamously perhaps) for a “zig-zag” pattern in the brick work of many of their buildings. A fine example of one of their buildings (still standing) is Quebec Manor at East 7th Ave and Quebec Street. Photograph shows Shaughnessy Mansions under construction at 15th and Granville, 1912. Photo: Cov Archives – Trans P89. Despite the noticeably sloping floors and other ‘wabi-sabi’ details that came with age, it was a sturdy old gal. Proving as such when a van smashed into the ground floor early one Sunday AM (at first I thought it was an earthquake). When the building was sold several years ago it was torn down (save for the front façade) in yet another example of architectural taxidermy that has become popular in Vancouver lately. For those who don’t know, architectural taxidermy is the situation where developers literally “skin” the exterior of an old building and re-apply it to a new structure (stuffed inside). In my opinion, this practice of architectural taxidermy is a pathetic attempt by developers to fulfill their heritage preservation requirements. What is supposed to be seen as a nod to the history of the building is really only lip-service. It should not be confused with actual preservation. 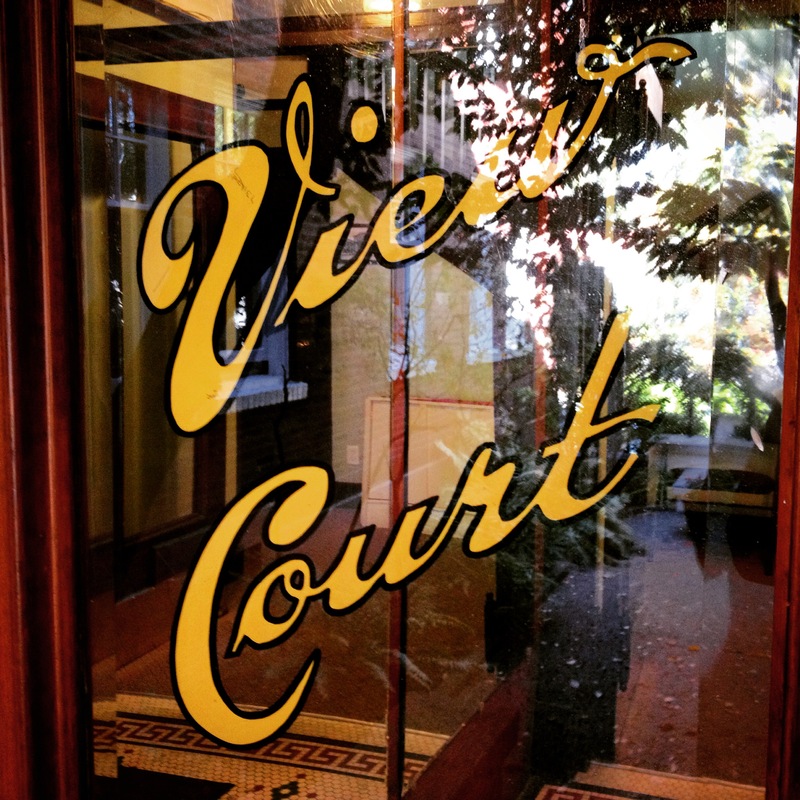 The apartment building I moved into is part of the View Court Housing Co-Op, and was also built in 1912. As history is my hobby and since this building will be my home for the foreseeable future, I decided to investigate the history of the building. View Court Co-op consists of two heritage buildings (a duplex house and 3 story brick apartment building) built across two adjacent lots at the SW corner of West 10th Avenue and Ontario Street. North view from 11th and Ontario St. ca. 1901. Detail shows the original structure at 10th and Ontario (middle ground). COV Archives – LGN 655. The duplex house, originally a single family dwelling, was built in 1905 by the then property owner, James G. Chalmers (1857-1927). It replaced an earlier dwelling built on the same property in 1894 (according to a water service record from that same year). The 1905 house was the first in the City to be constructed with cast cement blocks onsite, which makes it now the oldest example of a cement/concrete block residence in Vancouver (see 1905 newspaper clipping at bottom of page). Prior to the construction of the apartment building, the address of the house was 4 West 10th, it became 2617 Ontario St. after 1912. Original Building Permit registry information for Ryan Court. James G. Chalmers is listed as the owner on a building permit issued June 4, 1912 for a three-story brick apartment to be constructed adjacent to his house on the same property. This brick apartment building was constructed in 1912 by Edward J. Ryan (1884-1952) of E.J. Ryan Construction Company and was designed by the architectural firm of Perry & Nicolais (1911-13) the same firm that designed the Sun Ah Hotel on East Pender Street. By the end of construction, in late 1912, the proprietor was named as Edward J. Ryan (as evidenced by his name on the water service application) and thus the building was first known as Ryan Court. Ryan resided briefly at Ryan Court (Suite #2) ca. 1915. 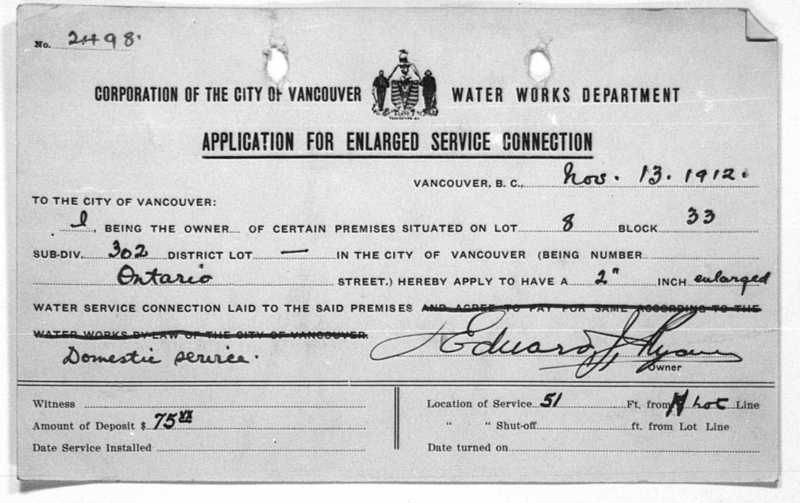 Water Service record dated Nov. 13 1912 for apartment building showing Edward J. Ryan as the owner. I am very curious to find out the back story as to how the ownership of the building seemed to have been transferred from Chalmers to Ryan within a span of 6 months. As yet, I have no leads. I can only speculate that somehow Chalmers financial situation changed dramatically in the latter part of 1912 and that Ryan took over ownership as compensation? City Directories of the time reveal that Chalmers was working as bookkeeper (1903-1906), a salesman (1907), a shoe merchant at C+M Shoe Co. (1908-1912) and then it gets a little murky. In 1913 a general financial depression began, resulting in the frenetic pace of building of recent years grinding to a halt. (Perhaps this was a factor?) Chalmers is not listed in the 1913 directory, nor is the C+M Shoe Co. (a failed business?). In the 1914 directory 2617 Ontario St. is listed as being “occupied”, but no name given (this usually means that no was home when the city directory representative knocked on the door, but that they noted that the house was clearly occupied at the time). It isn’t until 1915 that James G. Chalmers shows up as residing at 2617 Ontario Street. However, this time he is listed as working for James G. MacKinley, Notary Public. In the following years he seems to drift from job to job – clothier (1916), employee at Spencer’s (1917) and clerk (1918) – though it is possible that it is actually the same job and that he was a clothing clerk at Spencer’s (Department Store). By 1919, he is still listed in the directory, but now has moved from his Ontario Street residence, so that is where I drop the trail on James G. Chalmers. He died in 1927, and is buried at Mountain View Cemetery in Vancouver. 1918 city directory listing for James G Chalmers, also shows listing for a Mary G Chalmers at the same address. During WW1, Edward J. Ryan put his construction business on hold while he served with the 11th Regiment Irish Fusiliers of Canada; he was awarded a DSO (Distinguished Service Order) for his service. By 1920, Ryan has resumed his construction business in Vancouver. He would continue working in construction until 1950. He passed away two years later. The brick apartment building and the duplex that is now 2617 and 2619 Ontario Street, both underwent considerable renovations in 1936. This was in part due to damage caused by a large fire, which destroyed the Chown United Church (wood frame) across the street. It was at that time that the apartment building was renamed View Court, for when the ruins of the church were cleared away; all the suites on the north side of the building had a magnificent view of the city. Around 1949, the original single-family house was converted into a duplex. 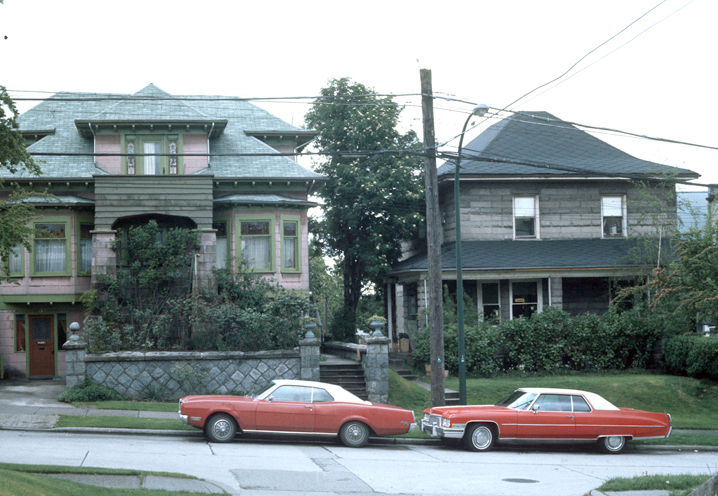 1977 Planning Department photo showing the 1905 house (right) on Ontario St. Photo: CoV Archives – CVA 780-256. As with any research topic, there are many avenues of information and resources one could still consult depending on how much detail is desired and effort one wants to invest. For now, I am satisfied with the history of the property that I have compiled thus far. Though I imagine there are many interesting stories that as yet, remain untold. Many thanks to Patrick Gunn at Heritage Vancouver for filling in blanks for me and providing the much needed information about the 1905 house (including sending me a copy of the Vancouver Daily World article about the construction of the house – see below). 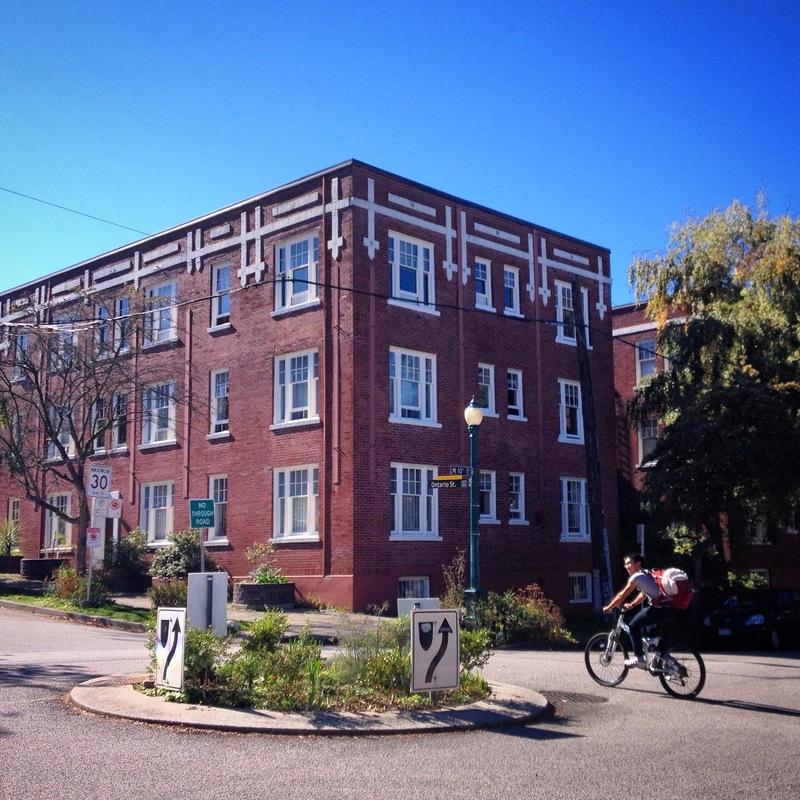 Patrick is the lead for Heritage Vancouver’s – Vancouver Building Permits online project. 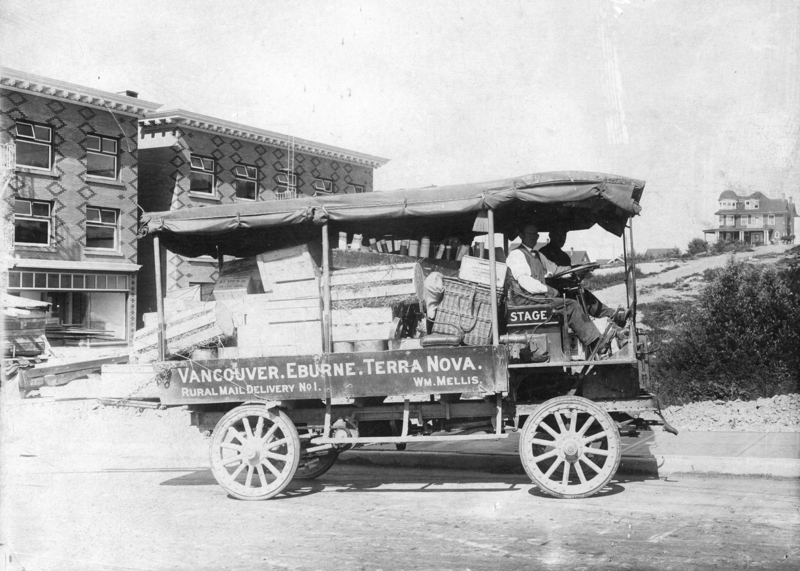 Volunteers have transcribed information from the original building permit registries held at the City of Vancouver Archives. Over 15 years of volunteer service has gone into this project; they currently have 34,759 permits online. A section of building permits (1905 to 1908) are sadly long missing, therefore researchers like Patrick have been scouring old editions of The Province Newspaper for building information. For the 1905 and 1906 data, they have transcribed basic building permit data which was published in the January 1906 and 1907 issues of The Province Newspaper (the information consisting only of the applicant’s name, project cost, basic description, and sometime the street name). 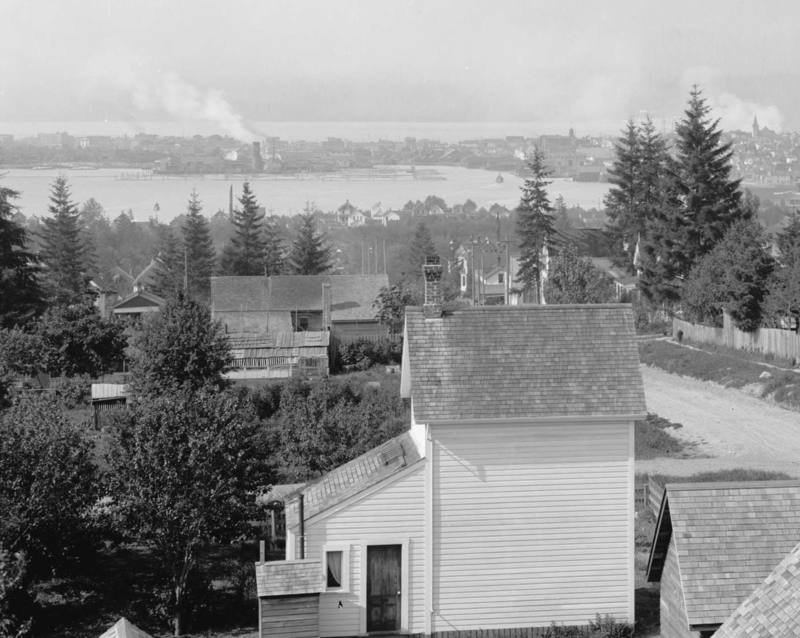 Vancouver Heritage has also located permit data from an additional source for the years 1907-1908, this data will soon be added to the online database. There is a detailed description of the Building Permits online project here. Heritage Vancouver can always use volunteers to assist with data entry for this invaluable project. And if you are unable to donate your time how about donating some funding? Donations can be made online at http://permits.heritagevancouver.org/donate/ . Ongoing funding is needed to help fund database maintenance, future functionality, and to further the transcriptions of additional years. Vancouver Daily World article July 27, 1905.